Knowledge is power. As citizens of the state of North Carolina, we have certain rights under the law which allow us to observe, investigate, record, and report the actions of our government. It is vitally important that every citizen know and understand these rights and how to use them. The Constitution of the United States of America is our nation’s founding document, and thus is considered our highest – most important – set of laws. All other laws, be they local ordinances, state statutes, or national laws, must conform with and not violate the rights and rules set forth in our Constitution. On September 25, 1789, the First Congress of the United States proposed twelve amendments to the Constitution. Ten of the proposed amendments were ratified by three-fourths of the state legislatures on December 15, 1791. Those ratified articles constitute what has since come to be known as the Bill of Rights. Below are two of those ten amendments most relevant to a citizen’s ability to criticize government officials and policies. You have the right to state your opinion about pretty much anything you wish, as well as the right to publish those thoughts. 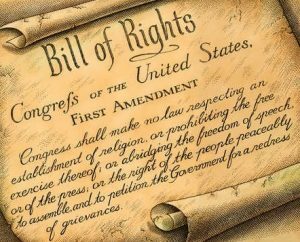 The First Amendment does not protect you from the consequences of your words, nor does it protect all speech. For instance, if you make statements that incite violence towards people or property, you may find yourself facing civil and/or criminal penalties. There’s a lot going on in the Fifth Amendment, but for our purpose here the most important part is what’s called the “due process” clause. Basically, due process means that no citizen of the United States can be hauled off to jail, prosecuted and convicted of a crime, or have their property confiscated by agents of the government without a fair, legal trial. The Bill of Rights originally only applied to our federal government; not state or local authorities. The Fourteenth Amendment is a fairly long article, so again I have only included Section I, the part most relevant to citizen watchdogs, here for the sake of brevity. In short this section says that all rights in the Constitution, including the Bill of Rights, also apply to state and local governments. Now we’ll move into laws specific to citizens of North Carolina. Please bear in mind that I am not an attorney and no part of this is intended to constitute legal advice. What I write here is simply my opinion. If you find yourself faced with cease and desist letters, court summons, or arrest, keep your mouth shut and call a lawyer! The federal Freedom of Information Act is the proper law to reference when requesting public records from the federal government. There may be other statutes which are agency specific as well. State and local authorities may honor requests made referencing this law, but in North Carolina they are not required to do so. Fortunately the North Carolina General Assembly passed legislation sometime in the past which became the North Carolina Public Records Act. The statute is fairly extensive. I’d recommend that anyone interested in making such requests of their local government or the state of North Carolina take the time to read Chapter 132 of our General Statutes in full. (a) Every custodian of public records shall permit any record in the custodian’s custody to be inspected and examined at reasonable times and under reasonable supervision by any person, and shall, as promptly as possible, furnish copies thereof upon payment of any fees as may be prescribed by law. This says that state or local government must provide you with copies of emails, invoices, meeting minutes or recordings (less any protected information such as personnel matters; read the statute) in a timely manner. My experience in Ramseur has been that if it exists in electronic form they will email you a copy or place small requests on portable data storage devices free of charge. If copies must be made of physical documents they charged me $0.25 per page. (b) No person requesting to inspect and examine public records, or to obtain copies thereof, shall be required to disclose the purpose or motive for the request. You are under no obligation to tell them why you want to see any records you request or what you plan to do with the information. They cannot ask for nor can they deny your request because you refuse to answer such questions. (c) No request to inspect, examine, or obtain copies of public records shall be denied on the grounds that confidential information is commingled with the requested nonconfidential information. If it is necessary to separate confidential from nonconfidential information in order to permit the inspection, examination, or copying of the public records, the public agency shall bear the cost of such separation. If confidential information is found within the documents you request, they cannot charge you for the time required to redact or remove said information. If you wish to record a public meeting you cannot be denied the right to do so as long as you are not interfering with the meeting. There are a few more paragraphs to this statute, but they generally pertain to broadcasting and the placement of equipment for said use. There are probably many other relevant statutes that I haven’t covered here, and as they come to light I will either update this post or write about them elsewhere. 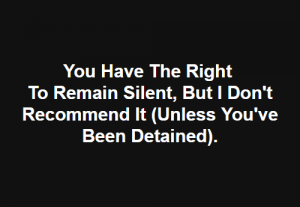 Bottom line: you have a right to speak your mind, and so long as you speak the truth and have taken reasonable steps to verify or collect evidence that proves the truth of your statements and there’s not much government officials can do to stop you. You have the right to sit in any open public meeting with a camera or a recording device and record the proceedings to your heart’s content, and you may publish those recordings as well. You also have the right to ask for any government record, whether local, state, or federal, as long as you know who and how to ask. You are under no obligation to state why you wish to review such records or what you plan to do with what you learn from them, and as far as I can tell you cannot be required to provide your name, address, or any other personal information when doing so.